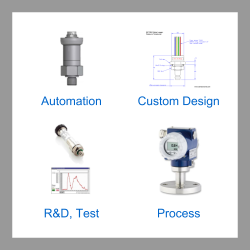 ATEX approved pressure transmitters for use in hazardous zones with flammable gases present such as petrochemical refineries and natural gas distribution pipelines. Select ATEX approved pressure transmitters which are certified for use in a hazardous area which requires the use of instrumentation which prevents potential ignition sources of flammable gases. KX ATEX Intrinsically Safe SIL2 Approved Pressure Sensor- The Gefran KX pressure sensor is ATEX approved for use with intrinsic safety barriers in hazardous areas, and is SIL 2 approved for additional safety. The KX is available in ranges from -1 to 1 bar up to 1000 bar. DMP 335 All Welded Stainless Steel Diaphragm Pressure Sensor- All welded stainless steel diaphragm pressure sensor for mobile hydraulics, refrigeration or oxygen applications. This pressure sensor is available in the ranges from 6 bar up to 600 bar gauge with a 4-20mA or 0-10Vdc output signal. KX ATEX Non-Sparking (Ex nA) SIL2 Approved Pressure Sensor- The Gefran KX pressure sensor is ATEX Ex nA non-sparking approved for use in zone 2 hazardous areas with flammable gas or dust atmospheres, and is SIL 2 approved for additional safety. The KX is available in ranges from -1 to 1 bar up to 1000 bar. Send us your enquiry for ATEX Approved Pressure Transmitters to get assistance with this product type.